A brief video overview of our research. We are excited about our research, and this video tries to convey that excitement! Ryan Morco presenting his work at the Waste Management Conference, March 2019. Lindsay Grandy discussing her poster at the NACE student conference, July 2018. Graduate student Thao Do in front of his poster at the 2018 Aqueous Corrosion Conference GRC. Graduate student Thao Do demonstrating to OPG visitors how to strip oxides from a carbon steel surface using a high-powered laser. April 2018. Dr. Jiju Joseph from the Wren group and Dr. Mehran Behazin from NWMO discuss Jennifer Shin's poster at NWMO's Proof Test Facility, February, 2018. Graduate student Thao Do in front of his poster at the UNENE meeting, December, 2017. Jennifer Shin presenting her poster at the NACE student conference, 2017. Ryan Morco in front of his poster at the CSC conference, 2017. Progress meeting with our industrial partner NWMO, November 2017. 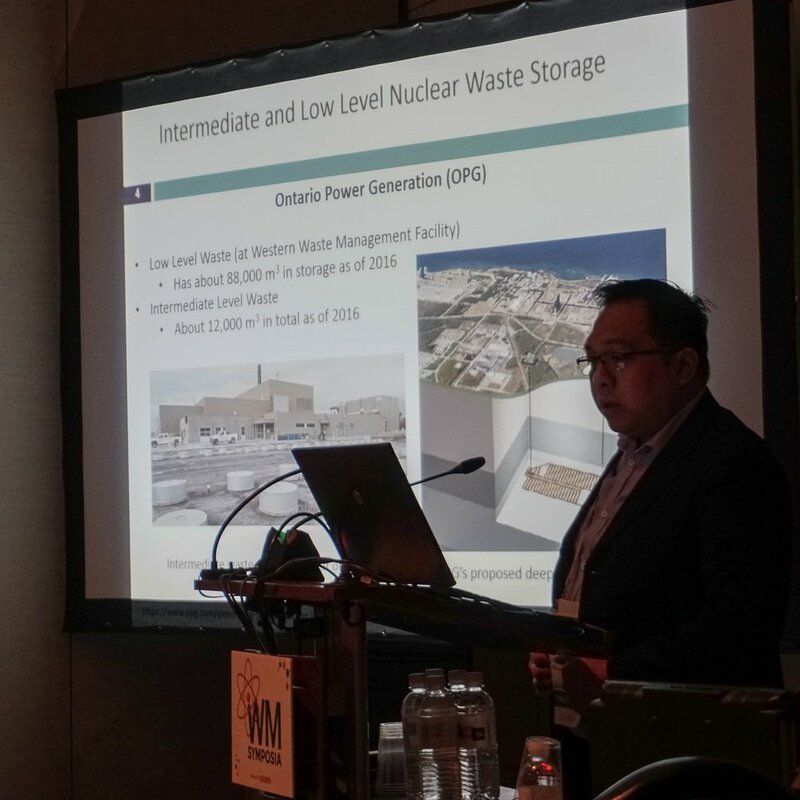 Thao Do presenting his work at the Waste Management Conference, March 2019. Thao Do and Mi Li (Wren Group graduate students) in front of Mi's poster at the 2018 Aqueous Corrosion Conference GRC. 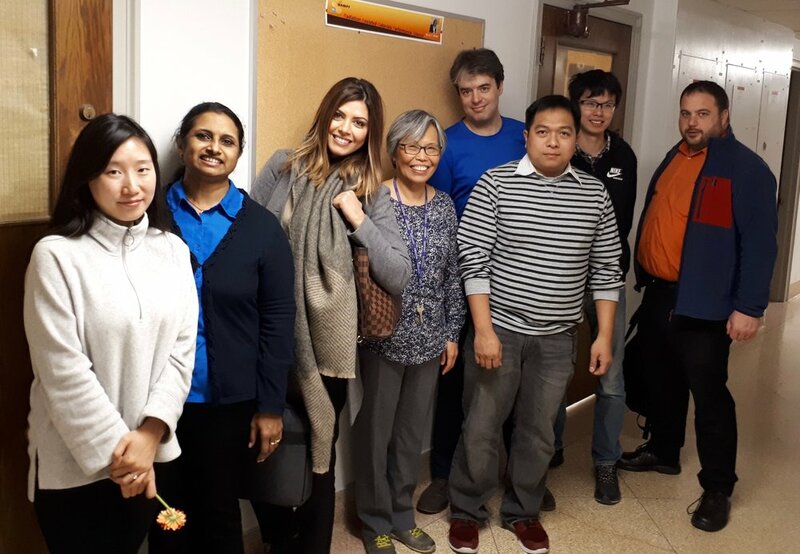 Graduate student Thao Do giving a presentation on his research progress at the OPG research update meeting, April, 2018. 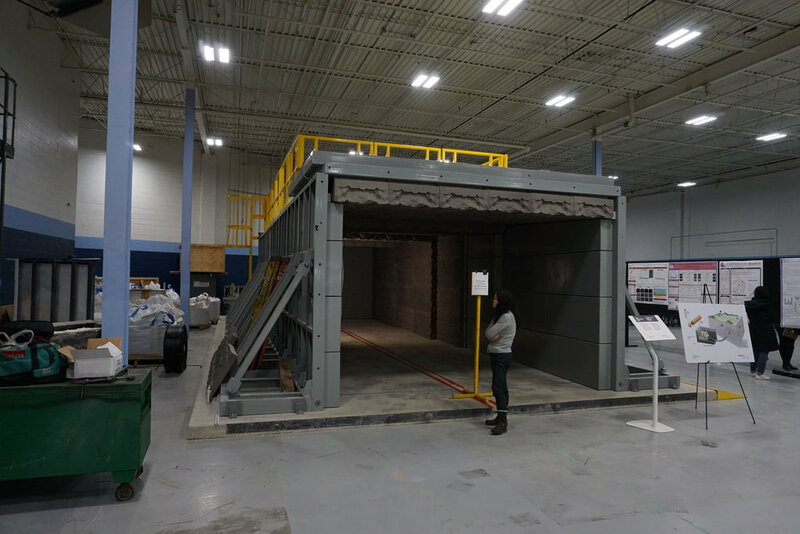 Mock-up of an emplacement tunnel for spent fuel containers at NWMO's Proof Test Facility. Bentonite clay buffer boxes and a hoist for turning them over, at NWMO's Proof Test Facility. PhD candidates Mi Li and Dan Guo in front of their posters at the UNENE meeting, December, 2017. 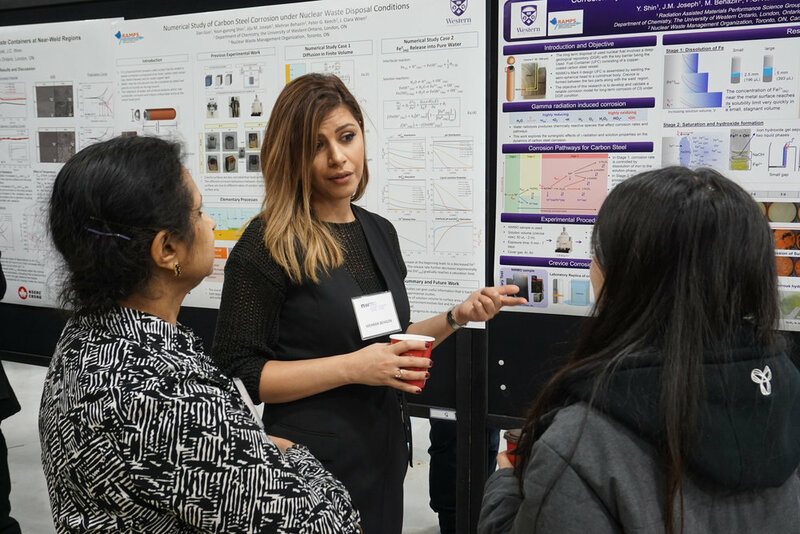 Rose Karimihaghighi giving an oral presentation at the NACE student conference, 2017. Dan Guo giving an oral presentation at the CSC conference, 2017. Progress meeting with our industrial partner OPG, November 2017. Members of the Wren Group and some Shoesmith Group members outside the Conference centre at the 2019 Waste Management Conference, Phoenix, Arizona. Thao Do presenting his work at the NACE student conference, 2018. PhD candidate Lindsay Grandy in front of her poster at the 2018 Aqueous Corrosion Conference GRC. PhD candidate Ryan Morco giving a presentation on his research progress at the OPG research update meeting, April, 2018. PhD candidate Ryan Morco explaining the process of producing geopolymers at the OPG research update meeting, April, 2018. 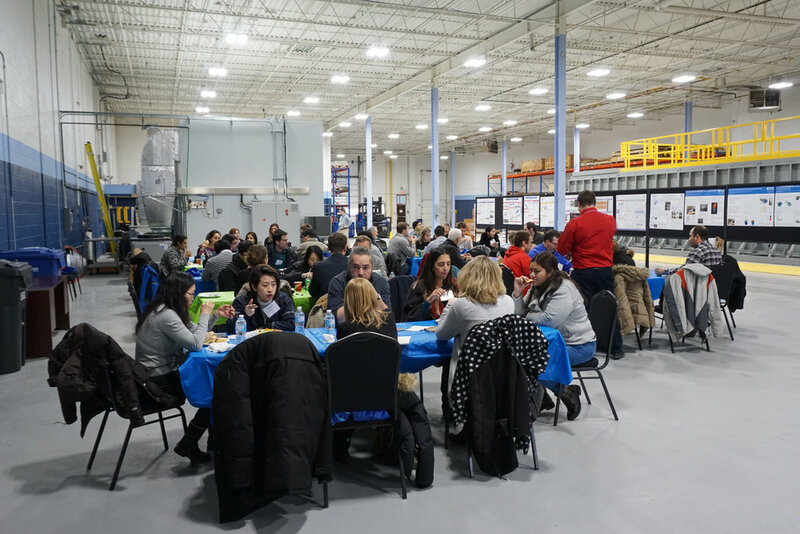 Lunch at the tour of NWMO's Proof Test Facility, February, 2018. Graduate student Lindsay Grandy discussing her poster at the UNENE meeting, December 2017. Mi Li presenting her poster at the NACE student conference, 2017. Drinks at the Grad Club to celebrate Dan’s successful PhD defense. Lindsay, Mi and Jennifer in New Hampshire for the 2018 Aqueous Corrosion Conference GRC. Clara's birthday party, March 2018. The start of the talent show at our Christmas party, December, 2017. Group Lunch at the Wave, 3rd May, 2017. A night out after the CNSC conference, 2017. 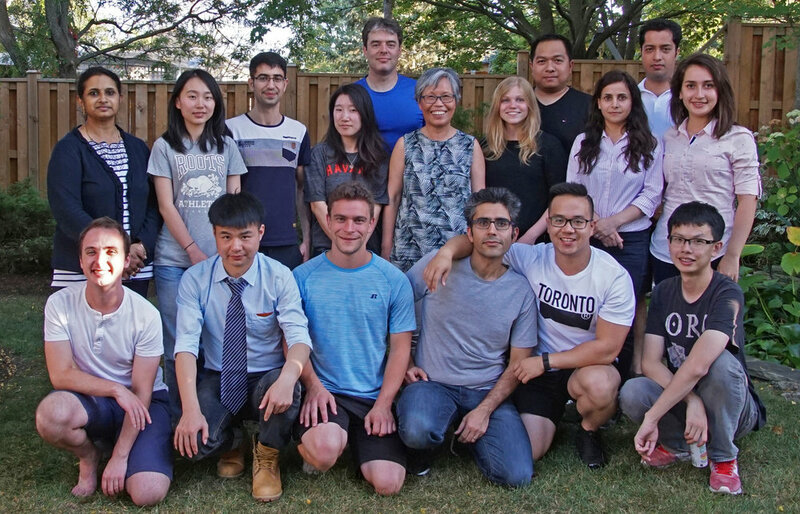 Max Fang's farewell party, 2017. Party to celebrate Dan’s successful PhD defense. Wren group graduate students out for a meal in New Hampshire while attending the 2018 Aqueous Corrosion Conference GRC. The unofficial group photo, 2017. Tom at the Grad Club just after graduating, 2016.